3 Bedroom Luxury apartment in a gated community on 6th floor with an elevator. Tastefully decorated and furnished for a relaxed vacation. The property includes a gas stove, refrigerator, microwave, laundry machine, patio furniture and separate bed room with shower for a house girl. Back up generator and borehole also included. The kitchen is fully stocked with stone counter tops, tile floors and a dinning room. Flat screen TV in living room and Master Bedroom. WI-FI included. There is King size bed in Master BR, Queen size bed in second BR and 2 full size beds in third BR all with comfortable beddings. Minimum rental time of one week which includes pick up and drop off from Airport. Originally from Kenya I use to really struggle finding a great place to crush before the last leg of my journey to Rift Valley. My husband and I purchased this place for our family ( our 3 teenage girls). We have made extra effort to make sure its comfortable and relaxing. We hope you will enjoy it as much as we do. Now we all look forward to our trips to Kenya. Visiting family and friends or just touring takes another meaning when you have your own space including a comfortable bed with a soft mattress and a pillow to relax at the end of the day. Welcome home ..
Home sweet home away from home for our family and yours. powered by backup generator. security cameras and intercom for added security. Must have password to enter the elevator. Great location. Very nice apartment. Nice view. Living it up in Kileleshwa! What a pleasant surprise! 60 feet straight up and settling on the 6th floor right in the heart of one of Nairobi's premier neighborhoods, this place lends such a nice feeling of privacy and solitude. 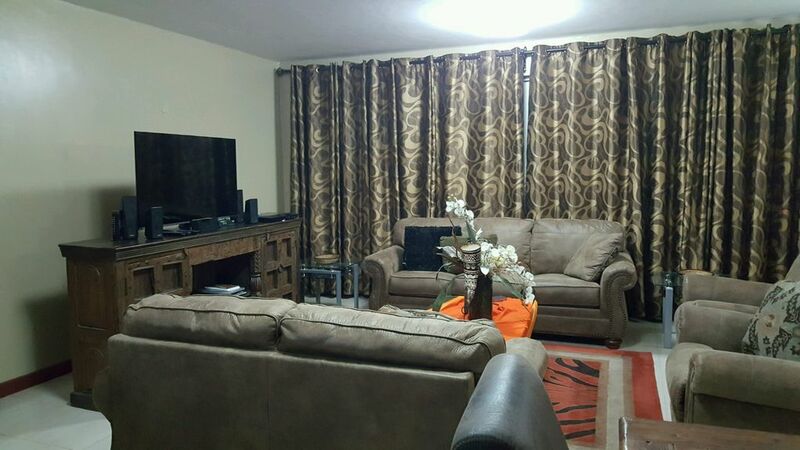 Close by to main roads, supermarkets, and even Nairobi itself, this spacious little getaway is a treat for anyone wanting to just "get away and be left alone" Fresh air, clean accommodations, safe guarded security gate and plenty of space to crash after a long day of...WHATEVER! The large 15 foot long outdoor veranda with sliding glass doors could even double for an extra bedroom! Being from the US, I have been to many places in Kenya and by far, this place has them all beat. Local car wash just down the street and even a corner produce cart just outside the main drive makes a short run out for a clean car and a bunch of bananas a real convenience! Worth every penny, (or KSH) Dorothy, I am looking forward to my next trip to your place....I just have to get there now!